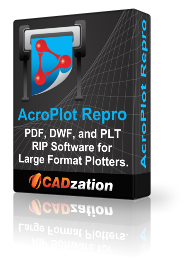 - CADzation's AcroPlot line of software has always been able to produce some of the highest quality PDF files on the market. But when enabling the “lines merge” in PDF files the software that does the final rendering (Ghostscript or Adobe) to create the output for the plotters have had a hard time converting the large format files because they are not optimized for large format drawings. AcroPlot Repro solves this problem. Faster processing, better dithering, and the ability to actually convert files at higher dpi (which currently Ghostscript seldom does) means you can now create the same high quality output on your plotter as you see in the PDF file.